Similar to World Wrestling Entertainment, in which a last minute revelation between two contenders adds a penultimate twist to the ensuing battle, or, likewise, similar to the endless last minute made-to-order epiphanies in Soap Operas, politics too is taking on a melodramatic entertainment value. The Drudge Report’s Matt Drudge has initiated rumors that lawyer Gloria Allred will reveal an “October surprise” aimed at shooting down Republican presidential hopeful Mitt Romney. Whatever the secret or scandal, it might take the pattern Allred used when GOP Meg Whitman was running for governor of California. Allred represented a former housekeeper who claimed she was fired for being an illegal immigrant. Whitman lost the election to Democrat Jerry Brown. The New York Conservative blog, The Red Side of Life, takes such shenanigans seriously, writing, “Gloria Allred Prepares Anti-Mitt Strike You can STOP Her Now! (action!) Don’t underestimate Gloria Allred’s ability to inflict damage. Other conservatives are less mollified. 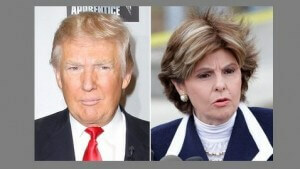 Donald Trump spoke to TMZ, saying, “I hope its Gloria Allred. She’s close to incompetent … she’s a terrible lawyer,” and he referenced a skirmish she brought against him. Trump spent some time in equally ambiguous talk of his own revelation, this one against Obama, scheduled to be exposed Wednesday. “It’s very big,” he said, without explaining at all what it is, or even how either party would react to it. Rumors were initiated by The Drudge Report’s Matt Drudge that lawyer Gloria Allred will reveal an “October surprise” which is aimed at shooting down Republican presidential hopeful Mitt Romney. Call it a secret or scandal, media “eats up” anything lawyer Allred feeds them. While other conservatives like Donald Trump said, “she’s close to incompetent and a terrible lawyer.” With last minute reversals and tweaks, the election promises to give its entertaining bit.